On the one-hour ferry ride from Maui to Lanai, we saw tons of whales plus a pod of spinner dolphins and not much else, a welcome sign after a few days in overdeveloped Wailea. 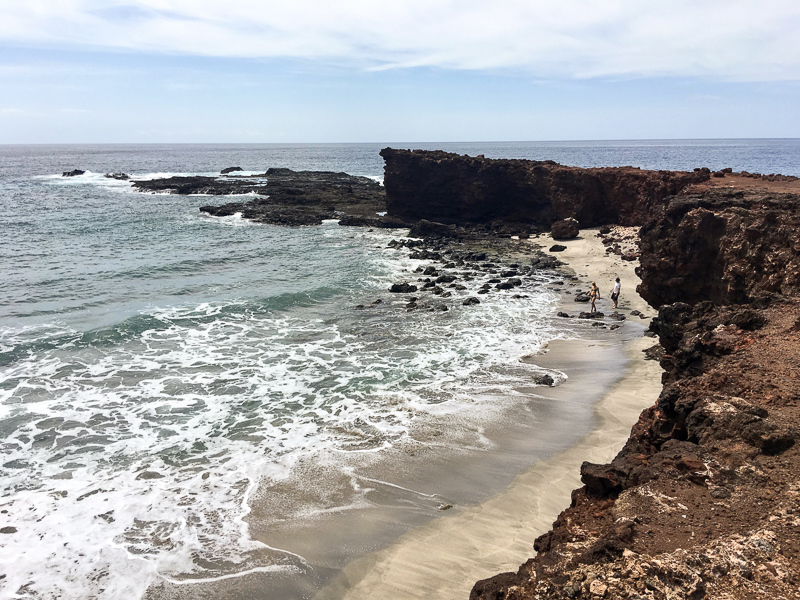 If you’re looking for action, Lanai shouldn’t be your first choice; compared to Maui, just some nine miles west the two islands share little similarities. Tiny, sleepy Lanai has a quiet, laid-back vibe, beautiful beaches and though there are activities to keep you busy, people come here to relax and get away from it all. Island History: One of the smallest of the inhabited Hawaiian islands, Lanai has had many lives—once a Mormon Colony, then its time as a ranch, and most infamous as the worlds largest pineapple plantation. In 2012, Tech Billionaire Larry Ellison bought the entire 88, 000-acre, 140 sq. mile island and quickly began to leave his mark on Lanai. One of those changes was a complete overhaul of the existing Four Seasons resort. Stay: If you’ve been to the Four Seasons at Manele Bay in the past you won't recognize the place, fresh off a multimillion-dollar renovation and a seven-month complete closure. Gone is the glitzy white marble that never really belonged; now the look is more authentic, it just feels Hawaiian —very lush with mini waterfalls, ponds, and tropical landscaping. Rooms are spacious and state of the art. Ours had a wide, lovely balcony and we were tempted to linger all day. Our bathroom back home paled in comparison, as we were especially enamored with the Japanese Toto Washlet that opened and closed automatically and was always warm. Funny the things that make a room standout. Ideal day: Early morning is for walking/hiking. We started our days with a walk over to Sweetheart Rock or a hike along the trail that runs alongside the coast and golf course. Most of the guests tended to stay around the pool, perched up high with views of Hulopo’e Bay below. It’s laid out well with various seating areas, so you don’t feel on top of other guests. Maybe they were all lazy, but we didn’t mind the five to ten-minute walk that meanders down to the beach. Once there, even though it’s a public beach, we pretty much had it all to ourselves. The hotel provides full service with chairs and umbrellas and bringing lunch down from the Malibu Farm menu. Late in the day wander back to the pool for a cocktail in the hot tub; a perfect sunset soak. Swing Time: Golfers in the group will drool over the Jack Nicklaus designed course with dramatic ocean holes straight out of Golfers Digest. Built on lava outcroppings the three holes perched high on the cliffs serve as the ultimate water hazard for novices that may lose a ball or two. Views, the golf course's restaurant has ocean vistas to go with a Pacific Rim accented menu. Eat: There’s nowhere to really go, but you can dine very well at the hotel with an outpost of LA’s Malibu Farm and Nobu. We enjoyed the Farm’s salads and cauliflower pizza by day and Nobu’s sushi, rock shrimp and black cod at dinner. Alternative nights the hotel’s signature New American style steakhouse with plenty of fresh fish options, One Forty, is another option. We didn’t venture out but heard that in Lanai City, Blue Ginger and the Lanai City Grille are two solid dining options. More Action: There’s horseback riding, ATV rides, deep sea fishing, seasonal whale watching, plus scuba and snorkeling. On the other side of Lanai, by the former Lodge at Keole, hike the 5-mile Holoiki Trail, with incredible views at the top. Lasting Memory: It’s a story, but somehow my husband Brad, wound up on an outrigger canoe at 7 am with the local club that meets every morning for an intense two-hour workout. On the way back in, as I watched from shore, they encountered the resident pod of spinner dolphins. I saw a few people jump into the water to swim with the dolphins. You should have seen Brad’s smile. Lessons Learned: Did you know that Aloha is much more than a word for hello and goodbye, but a path, a philosophy of love, acceptance, and compassion. People say “Practice Aloha,” and in these trying times, it’s certainly something to aim for. What a great gift to bring home from a trip to Hawaii. Coming Soon: Keep an eye out for the reopening of The Lodge at Koele. The talk is its new life will be as a wellness retreat. With abundant hiking nearby and beautiful mountainous scenery, this is something to be excited about.